DEARBORN — More than 1,500 Palestinian prisoners have joined a hunger strike led by Palestinian parliamentarian and prisoner Marwan Barghouti, beginning April 17. 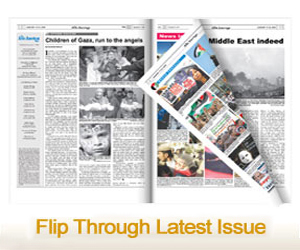 People all over the world showed their solidarity by organizing demonstrations and vigils. Some have participated in the “#SaltWaterChallenge”, in which they share videos of themselves drinking salted water— the sustenance on which the prisoners are surviving. 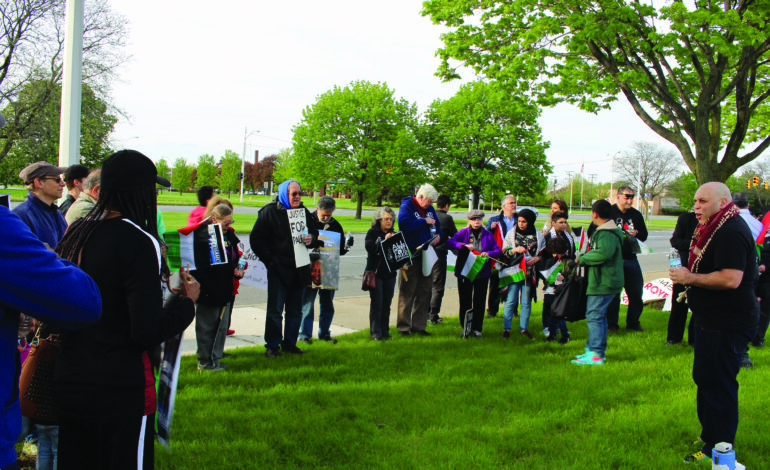 Locally, a small, diverse crowd of men, women and children gathered outside Henry Ford Centennial Library on May 3 at 6 p.m. to demonstrate solidarity with those on the hunger strike. They peacefully carried banners and Palestinian flags as passing cars honked in support. Local activist Amer Zahr organized the vigil and reached out to American Muslims for Palestine and Jewish Voice for Peace-Detroit to spread the word. He said the vigil also aims to raise awareness about the illegal and inhumane conditions that Israel enforces on the prisoners. On April 16, Barghouti, who is serving a sentence at Hadarim Prison, announced the strike through an opinion piece for the New York Times, demanding an end to Israel’s merciless system of oppression and abuse. Barbara Harvey, the head of Detroit’s Jewish Voice for Peace, discussed the three main demands: An end to administrative detention, an end to solitary confinement and the right to family visits. She said administrative detention is the method by which Palestinians, including hundreds of children, have been imprisoned for throwing stones. She added that solitary incarceration is also imposed on children. Harvey said family visitations are hypothetically allowed, but all the prisons except one are in Israeli occupied territories. A few in attendance also shared their thoughts and experiences with The AANews. Detroit resident Karen Donahue said she visited Palestine three times and saw the occupation up close. She said she wants Palestinians to know they’re not forgotten and that there are many Americans who are starting to recognize the truth. A 13-year-old Palestinian American boy named Mohamad wore a Palestinian keffiyeh— a symbol of nationalism— around his neck. He said he came with his mother and 7-year-old brother because he wants to free the people in Palestine. A Palestinian American father and his two sons also came to show their solidarity. Muhammad Odeh said he saw the suffering first-hand, as at least 20 percent of the residents in his village were imprisoned. Odeh said he wants his boys to learn the importance of activism from this stand, so they can eventually become activists for the Palestinian cause themselves when they grow older. At the end of the vigil, Zahr asked those in attendance to drink water in solidarity with the prisoners.